Ten-year-old blonde Mari is a mixture of cheerful activity and warmth, and she is considered one of the friendliest people in SOS Children's Village Keila, Estonia. It is impossible to hear something negative about happy and freckled Mari. She is so open and active that it seems like she is glowing with warmth. One of the co-workers from SOS Children's Villages Estonia remembers that Mari was the first person with whom she became friends. "She is super!" she says. "Mari has participated in all our events; she is attentive and as fast as quicksilver." One day, a group of children went to a horseshow and the children found that there were many possible activities to try out - they could choose to ride a pony, get their faces painted, or play different games. "Everybody was still thinking about what attraction to choose first, but Mari had already done three laps with the pony and had had her face painted," remembers Mari's friend. "I make friends easily," the girl herself admits. "If somebody I'm not familiar with is doing something interesting I just approach them and join in, and the rest is easy," Mari explains. As Mari is an inventive girl, she does not stay home after finishing a day of school at the SOS Hermann Gmeiner School in Keila - she has swimming and skiing lessons three times a week. 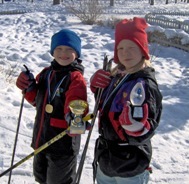 "She started skiing training only this year - last year she won the championship in Keila in her age group - without having had training! She is doing well in swimming, too," says her SOS mother Erika. Her mother admits that the busy little girl sometimes reminds her of a boy. "She even quit gymnastics because she loves football more!" But this liveliness is only one side of her. "Mari is a very active person, and she is a winner at heart, but she is also a great help for me," Erika says. After doing her homework Mari plays with her two- and three-year-old sisters or goes outside with them. "She is an exceptional big sister! In the evenings she reads poems and sings to the little ones - they already know some of the poems by heart." "Sometimes, when the little ones wake up early at the weekends, she takes them to her room and says: "Be quiet! Everybody else is still sleeping." Then she reads poems to them. She does not like to read regular books so much, she prefers poems, and she has a pile of poetry books in her room." Mari joined the village when she was only one and a half years old, together with four older brothers and sisters, and obviously, Erika is proud of her joyous little helper. Two of Mari's SOS sisters are now living independently; one brother lives in an SOS Youth Facility, while the other one is still with Mari at the village. "I'm very proud of her, she is doing so well at school - she only gets the best possible marks! She is a witty girl and I have only had to help her develop her habit of focusing her efforts when she is learning something. In this respect, Mari had a very useful experience this summer, since she got to dub Astrid Lindgren's "The Children of Noisy Village" into Estonian. I saw the film and she did wonderfully well!"